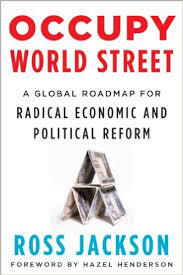 Ross Jackson is an interesting guy who has just published a very interesting and timely book entitled Occupy World Street: A Global Roadmap for Radical Economic and Political Reform (Chelsea Green, 2012). Born a Canadian, Jackson has a PhD in Operations Research from Case Western Reserve University, but has lived in Denmark since 1964. Not only is he the former manager of a hedge fund, financial derivatives, currency-exchange trading firm, but he currently heads up two international NGOs related to small, sustainable, ecovillages. The current political leadership’s inflexible focus on economic growth makes it impossible to deal effectively with global issues like climate change, ecosystem damage, peak oil, and rationing resources. Meanwhile, millions, if not billions of ordinary citizens are dissatisfied with the status quo and are crying out for change. The dilemma seems to be: those who can, will not; those who will, cannot. While there may be little we can do to stop this process, there is a lot to be learned from the experience. Now is the time to begin thinking about how we want to live, love, work, play, and do business in a more localized world. It could prove to be a much more meaningful experience than life under globalization. The Gaian World Order would be launched by a dozen or so small nations which would constitute what Jackson calls the Gaian League. The Gaian League might include such countries as Bolivia, Sri Lanka, Costa Rica, Iceland, Norway, Venezuela, Senegal, Bhutan, New Zealand, Maldives, Tunisia, Mauritius, Malaysia, and Switzerland. Once established, other nations would be invited to apply for membership. The first order of business for the League would be the founding of eight other multinational organizations: the Gaian Trade Organization, the Gaian Clearing Union, the Gaian Development Bank, the Gaian Congress, the Gaian Commission, the Gaian Court of Justice, the Gaian Resource Board, and the Gaian Council. That’s a lot. For those concerned with where life is going on the flagship earth and whether or not they want to go there, Occupy World Street is not only a wake-up call but also a call for action and a strategy for changing course before it’s too late.